Lennyloveslife – "If you do what you need, you’re surviving. If you do what you want, you’re living." 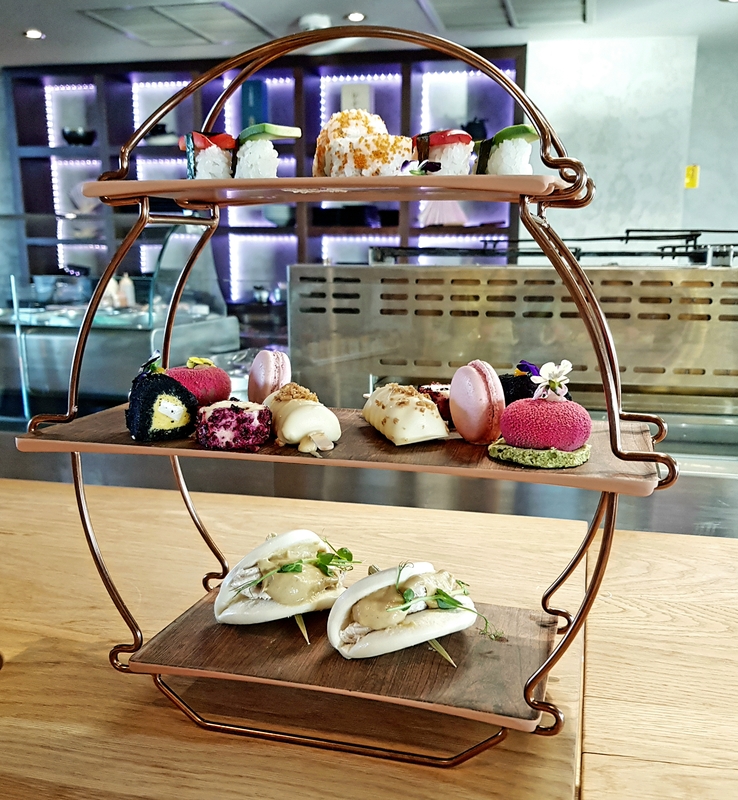 As part of my new role at work, I was invited to attend a meeting with work colleagues held at University College Birmingham, which meant our lunch was to be served at their hugely acclaimed and award-wining restaurant, the Atrium. The Atrium should be at the top of everyone’s list of places to eat in Birmingham. However, it wasn’t at the top of mine, it was on my radar, but I never actually said I need to go there. Well, you guys need to go there. 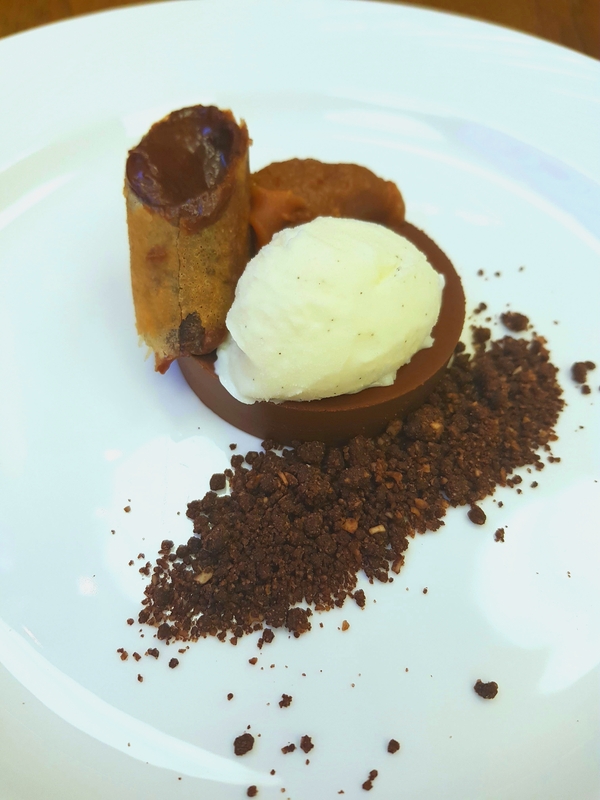 The concept is that everything from the food to the hosting is done by students at the college as they train to take the hospitality world by storm. You will need to bear this in mind when visiting as things are a bit slower than a normal fine-dining restaurant. They are, however, all supervised by lecturers and those who looked after us on the day were faultless, well from my eyes anyway. There were quite a few of us in for lunch that day, all from the company I work for, but we were the only people in the restaurant. The menus were nice and simple with just 3 starters, 3 mains and 4 desserts to choose from but the choices, I felt, covered all requirements. 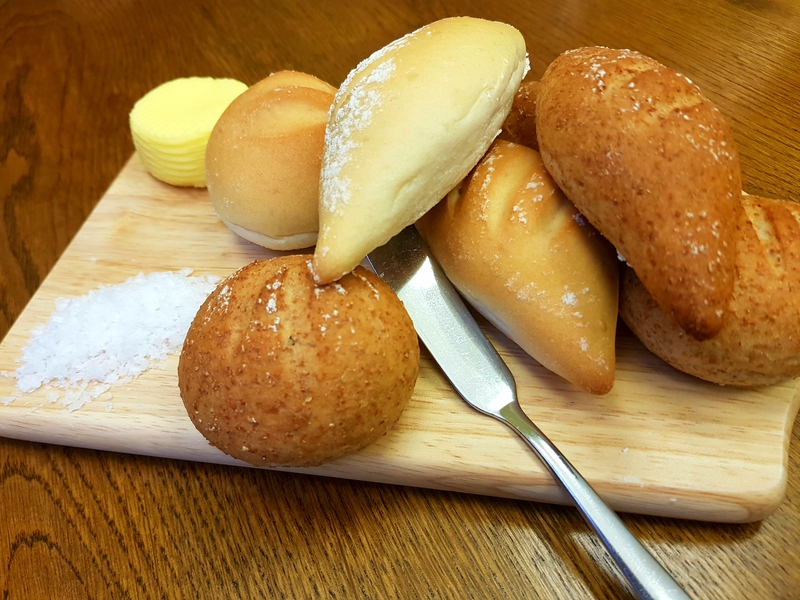 We were presented with a lovely selection of breads and freshly made butter to keep us going until our starters arrived. I am such a stickler for good bread and butter, especially the fresh and salty variety and this lot below ticked all those boxes. 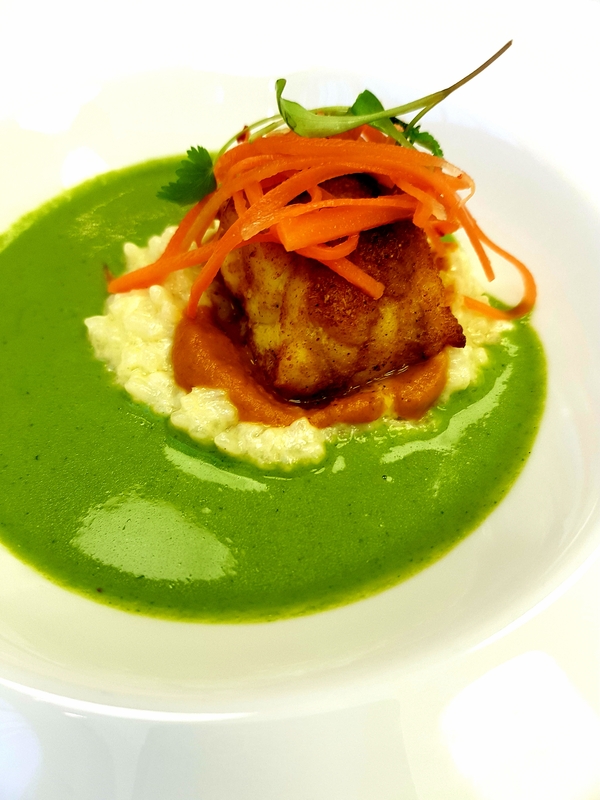 For starters I went for the Pan Seared Monkfish, Curried Carrot, Coconut and Lime Rice served with coriander sauce. The plating of this dish was just beautiful and they say that you eat with your eyes first. I did expect quite a strong taste from the coriander sauce, as this was the predominant colour on the plate, but the majority of the flavour came from the curried element of the dish. Although the curried flavour was quite over powering, it wasn’t an unpleasant taste to be overpowered by, if that makes sense! For mains I went with the Wild Mushroom and Spinach Pithivier, with globe artichoke puree and a sauce Béarnaise. Again, presentation was spot on. The main highlight of this dish for me was the pastry. Super flaky, buttery and just melt in the mouth. The mushroom and spinach filling was nicely seasoned and not to wet. The béarnaise sauce was silky and really complemented the dish. Dessert was a problem! I couldn’t decide what to have. Luckily, one of my colleagues wasn’t really a dessert person so I choose his too! 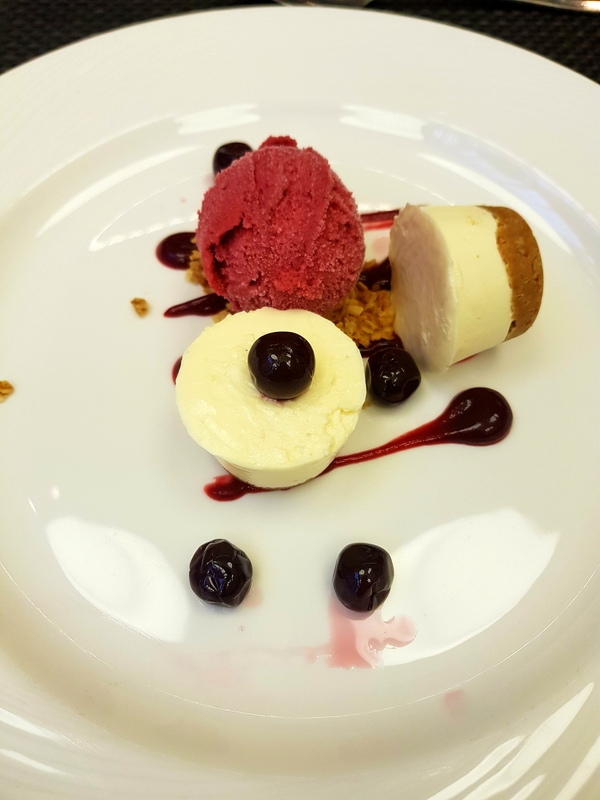 We (I) went for the Dark Chocolate Delice, Salted Caramel, Crème Fraiche sorbet and chocolate pastille, and the other option we (I) went for was the Vanilla Cheesecake, baked oats and cherry gel. The desserts were definitely the highlight of this meal for me. The Dark Chocolate Delice was really rich without being too much and the crème fraiche sorbet cut through that dark chocolate leaving a nice clean taste. The Cheesecake was like a heavenly plate of milky deliciousness! It was a set cheesecake rather than a baked cheesecake, which is my favourite type of cheesecake. It was so smooth and creamy and the sharpness of the ice-cream and cherry gel matched extremely well. I would really struggle to choose which dessert was my favourite, with them both being amazing dishes. The Atrium is definitely somewhere I would consider for either a leisurely lunch or an evening out. And the best bit is the price! Because it’s a training school you don’t get charged top dollar for what is evidently an excellent fine dining experience. Definitely a place to think of visiting for your next special occasion or just a nice treat, because let’s face it everyone needs one of those every once in a while. Personally, I am not a massive fan of New Years Eve, just seems a bit over the top. However, as it falls on a Monday (yesterday) I thought I would take the opportunity to start afresh. 2017 was a bit of a rough ride, ups (moving into my own place) and downs (splitting up with my boyfriend the same weekend) and real downs (when my anti-depressant medication wasn’t working and I literally thought I was having a breakdown!). But 2018 will hopefully bring a whole new set of challenges and adventures, so bring it on! To start the year off I changed my name! Well my last name, back to my maiden name. It was all pretty easy via a deed poll, so once this comes back in the post I will be able to start the arduous task of changing my name on all my cards, bills etc. Secondly, I am back on my weight loss journey. 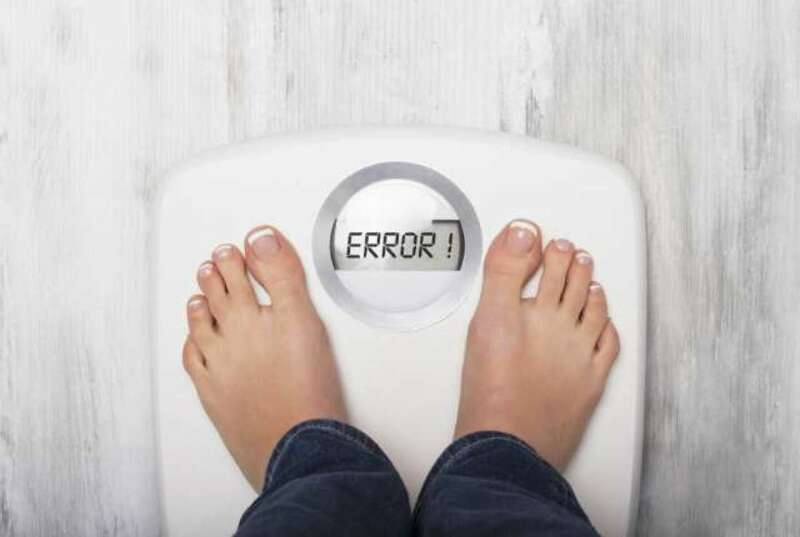 Getting on the scales yesterday morning was hard, and the figure it presented was not a weight I ever thought I would weigh and it is not a figure I am ever going to see on the scales again, well apart from the airport scales for my luggage! I am also starting a new role at work. I am moving to work alongside the Head of Food for a 3 month secondment and if all goes well it could become a permanent move. A nice new challenge for me and a role that I can really get my teeth into. My focus for this year is just to be me and the best me I can be. I need to really focus on my mental health and well-being and get my depression and low self-esteem under control. Hopefully, I can have some of you come along for the ride with me and I aim to blog a lot more through the coming year, with the normal range of posts – food, travel, food, health, food, beauty, food, lifestyle and maybe some more food! 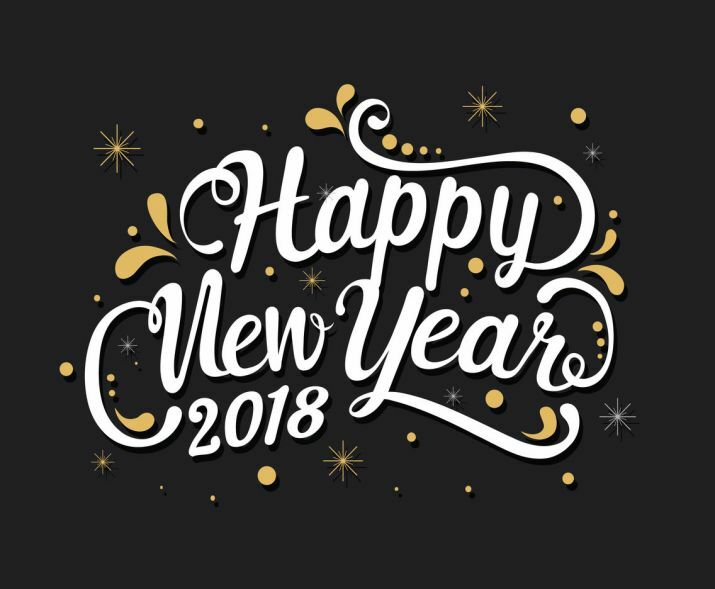 So here’s to a great 2018! Lets do this! 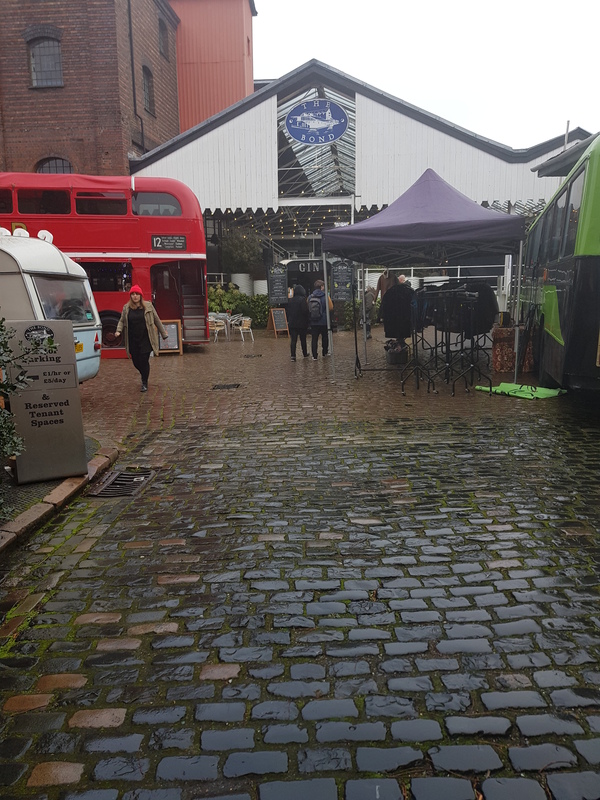 I’d been looking forward to the Winter Seasonal Market to happen at The Bond Company in Digbeth for months, well since I couldn’t make the Autumn one! Unfortunately, the weather wasn’t on our side. It was very wet and miserable, but I was still very much looking forward to it and hoping that the food would warm me up! I arrived pretty early so a few of the stalls were still getting themselves prepared for the day, so I did my usual walk around the food stands to decide what to have and a little wander round the indoor market area, where local independent businesses sell their wares! 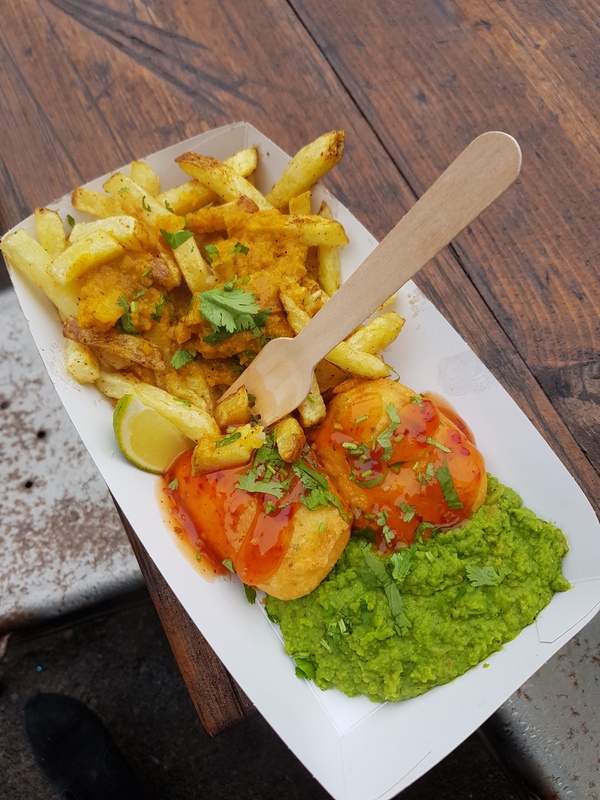 First up, I visited the English Indian stall and ordered their spiced pakora battered halloumi served with chat masala seasoned chips, madras chip shop sauce and mint and chilli mushy peas. Wow! The batter on the halloumi was so light and fluffy, the halloumi was nice and warm and the heat from the curry sauce definitely warmed me up! But the surprise star of the show for me was the mushy peas. I really dislike mushy peas in general and I forgot to ask for this dish without. Well, I am so glad I did forget as these peas were delicious, really creamy and created a great cooling element to the heat of the curry sauce. Well done English Indian I may be a mushy pea convert! I then grabbed a drink to wash it all down. I did really want to try mulled sloe gin, however it had apple juice in and I have an allergy to raw apple and can be temperamental with apple juice, so I had to make do (ha!) 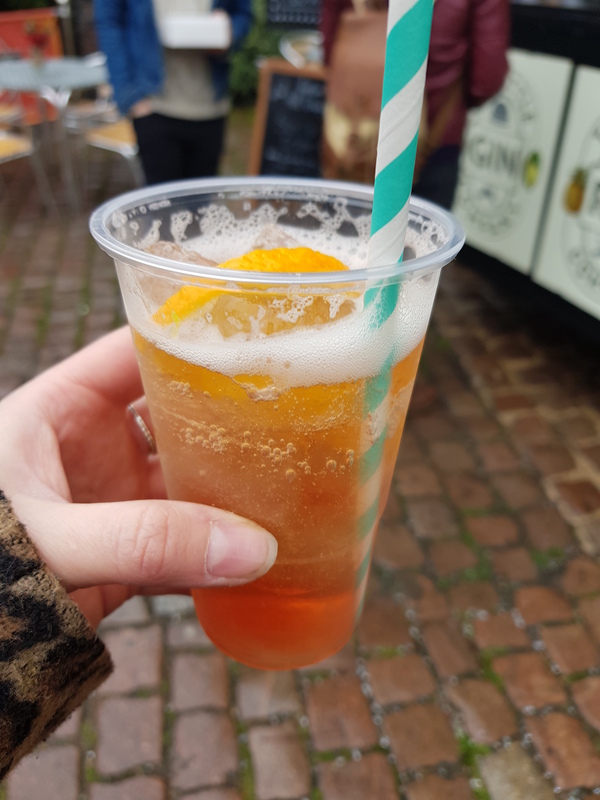 with sloe gin and ginger beer from the little gin company truck. And as one meal wasn’t enough, I visited Low and Slow. I have been sampling the delights from Low and Slow for quite a few years now and every time I go back I always struggle to decide what to have. 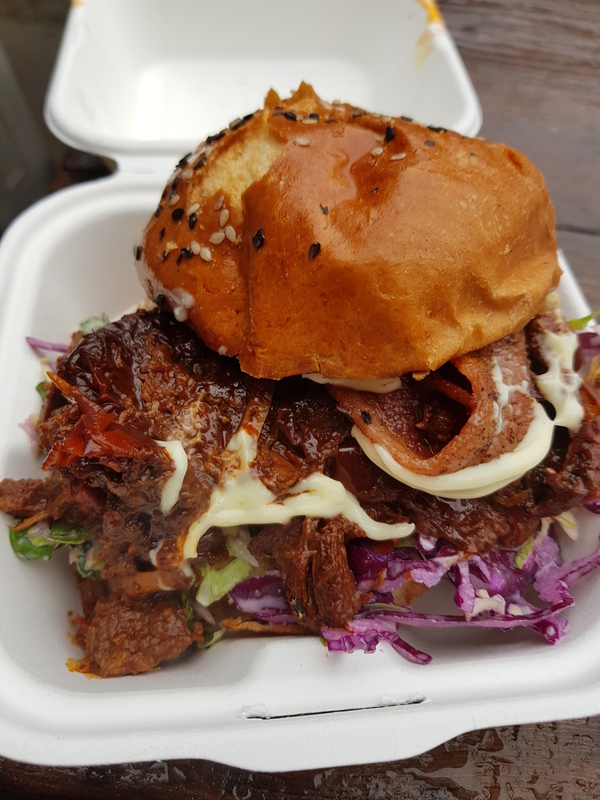 This time I went for the slow cooked brisket chilli served on a brioche bun with milk slaw and charcoal mayo. Boy, this was really messy and had a great big kick to it! I did have to eat the filling with a fork first and then eat the leftovers otherwise I was running the risk of turning my face orange! This was washed down with a mulled wine from the bus bar company. 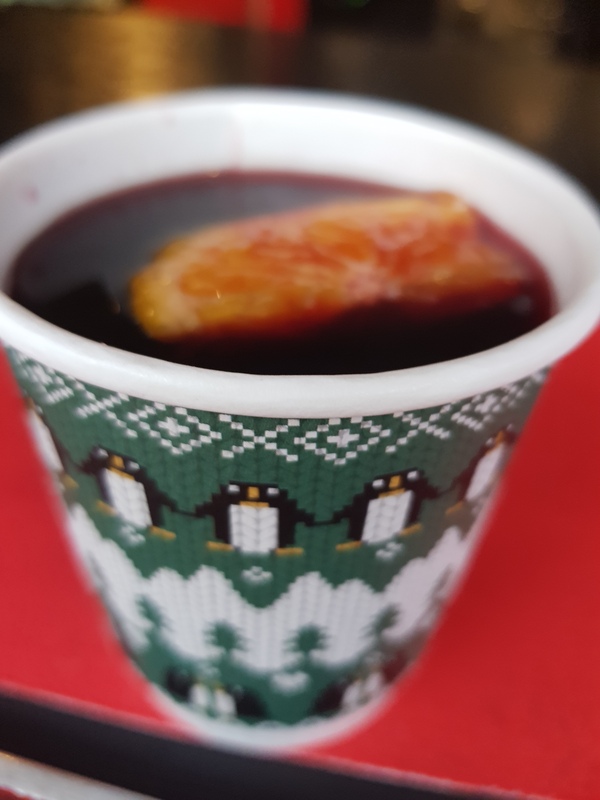 Again, mulled wine was something I never used to like, but this is my second one of the season! I was struggling for what to choose for dessert, it was a toss up between the Bournville Waffle Company and the Canadian Beaver Tail people. I put the vote out on instagram and facebook for you guys to choose what I should go for, and the only nomination was for the Canadian Beaver Tail stall. So, what were the Canadian Beaver Tail people offering, well basically it is a doughnut shaped like a beavers tail (big and flat). 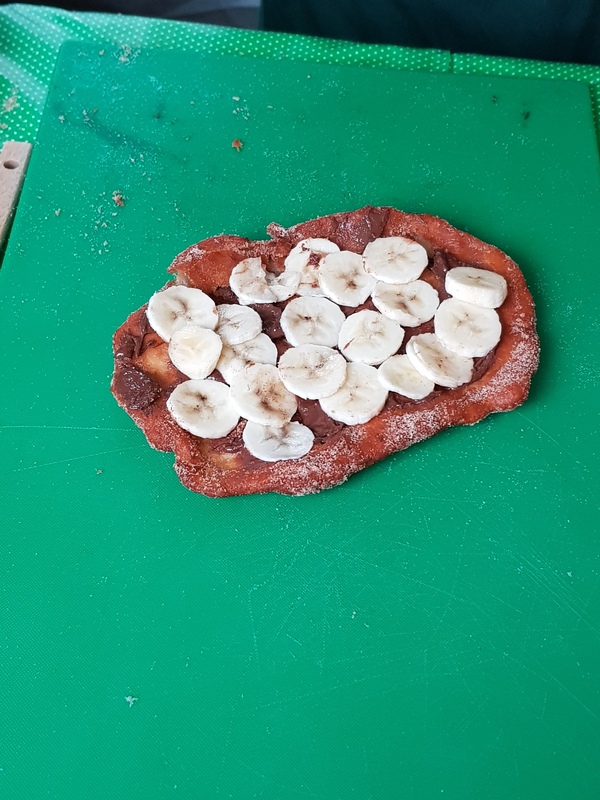 I had mine topped with nutella and banana. It was very good, but very filling. No trip to the Seasonal Markets would be complete without a visit to Bake. Is it bad that the guys from Bake recognise me?! I was quite restrained this time and just went for two slices of their Ferrero Rocher cake (one for me and one for my sister), their panettone bread pudding and one of their mince pie brownies. All were delicious, and I can’t really pick a favourite, but I must say the pastry on the mince pie brownie was so buttery and short and soo gooood! 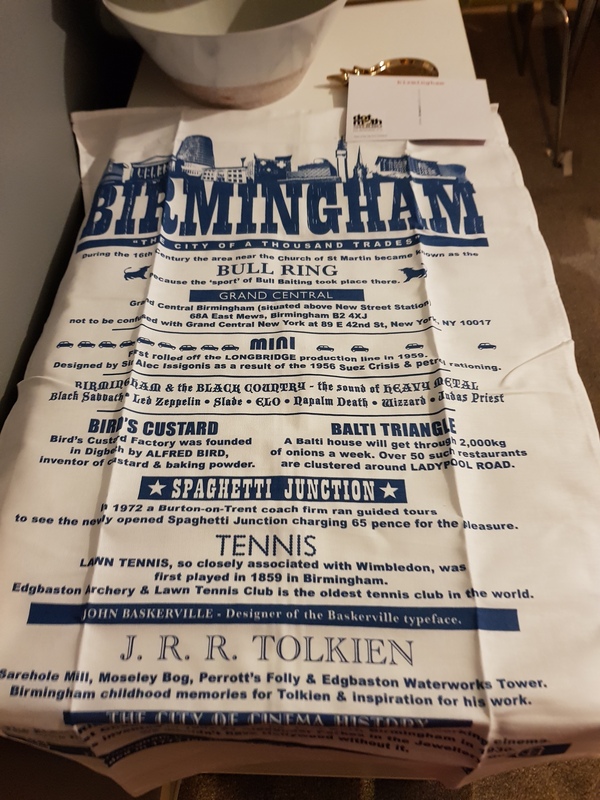 I also treated myself to a new tea towel from dot moth studio which has some cool facts about our lovely city of Birmingham. Did you know that the Bull Ring shopping area got its name because that is where the ‘sport’ of bull baiting took place! Need to check out what other things they offer! I can’t wait for the next seasonal market in the spring! Keep an eye on their facebook page for dates! So… I gave up! Well I have put my Isagenix journey on hold for a bit. With so many work meetings and christmas things on I didn’t really feel like I was getting the benefit of the program, so I will be restarting in the New Year. I really struggled with the cleanse days and just think my mind wasn’t/isn’t in the right place. I am disappointed in myself, but I need to learn not to be too hard on myself in relation to my weight as it only makes it worse! When I am back on track I shall just be using the rest of my products, but will need to reorder the tonics, so it’s going to cost me a bit more money, but I want to be able to do it right and I should have enough shakes and things for a good two weeks worth. I shall let you know when I restart! Lenny loves…Afternoon Tea @ Rofuto with Bumble! December 7, 2017 by lennyloveslifeLeave a Comment on Lenny loves…Afternoon Tea @ Rofuto with Bumble! I was one of the lucky few that had the opportunity to attend xameliax’s first Bumble event for bloggers at Rofuto in Birmingham. Amelia (check out her blog and youtube channel) has just become ‘Queen Bee’ for Birmingham, and has been tasked with organising and hosting various events in the city for Bumble. 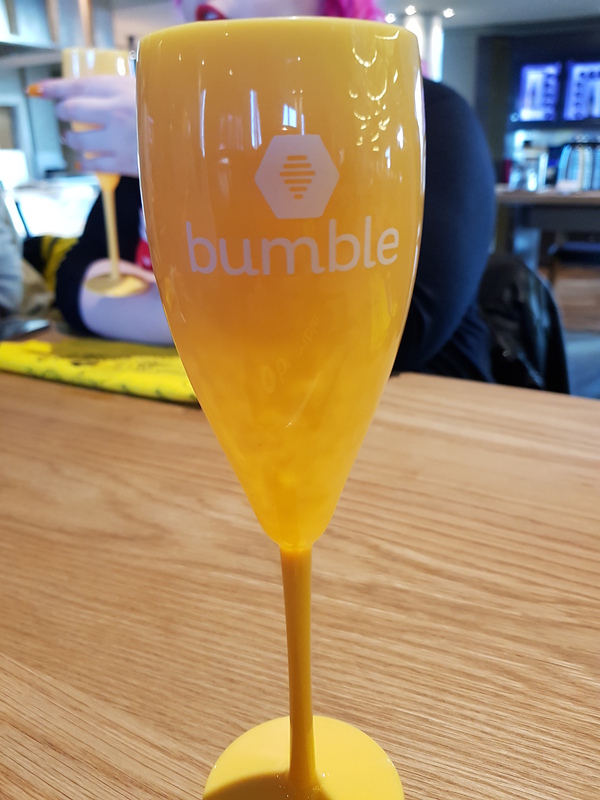 A bit about Bumble…they are an online app which you can use for dating, finding new friends and also has a business networking side. I have actually met a few people off the app, including one that I now consider one of my closet friends. I have also used it for dating, but enough said about that the better! Only kidding, it is great for dating, as it is up to the female to message once you have matched with a guy. You still get the issues with the guys not messaging back sometimes, but as it becomes more popular I am hoping more men will join up! Anyhow, back to the main event! Amelia had organised a fab Japanese themed Afternoon Tea at Rofuto. Rofuto, for those of you who don’t know, is a Japanese restaurant at the top of the Park Regis Hotel at the end of Broad Street. It is a place I have been wanting to try for a while, and this was a great opportunity to not only try it out, but to also meet some new bloggers from Birmingham and surrounding areas. Having turned up, I was greeted with a glass of Prosecco in a lovely bumble champagne glass and had the chance to chat to the other attendees (shout out to Sophie from Adventurous Soph, Maisie and Lottie from Hello Birmingham and Candace from Buckets of tea). Out came the sushi, with Smoked Pepper and Avocado Nigri and Smoked Salmon, Pickled Mooli, Inari, Orange Tobiko Uramaki!! Wow, that was a mouthful to say, and indeed a very tasty mouthful. My favourite was definitely the Smoked Salmon Uramaki. The other savoury element were the Coronation Chicken Bao Buns. Now I love me a good Bao Bun! I love how soft and fluffy Bao Buns are and the filling was yummy, just enough not to squish out! The sweet section of the afternoon tea was definitely the main event for me. They were absolutely stunning to look at and just as good to eat. First up we had a Salted Caramel and Kalamansi Petit Gateaux followed by a Rose & Lychee Macaroon; a Yuzu Cheesecake with Blackberry Glaze and Lime Crisp; a White Chocolate Peanut Butter Lolly with Bricelet Granules; a Mango, Coconut Sesame Roll and finally the scones; plain and raisin, served with lemongrass curd, strawberry jam and of course, clotted cream! They were all pretty darn good morsels of sweetness, but the stars for me were the Salted Carmel and Kalamansi Petit Gâteaux and the White Chocolate Peanut Butter lollies, which were semi-frozen and did prove difficult eating for some! The scones were really good too, although I definitely need more cream with mine! The display looked so bright and colourful, which is sometimes missing from most normal afternoon teas, where they can be quite beige! It was nice to chat to new people, all their with the same intentions, to make friends, in a lovely location, devouring delicious food! I will definitely be a) going back to Rofuto and b) attending more Bumble events! Have you checked out Bumble? If not, why not go and check it out for yourself! 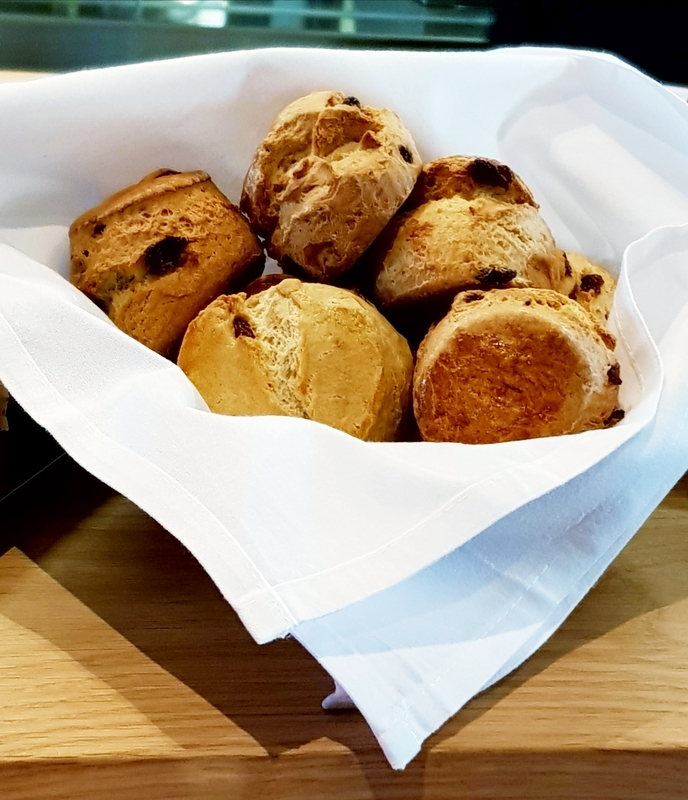 Disclaimer; Apart from the lovely afternoon tea, I have not received payment for this post, or been asked to write this post, just wanted to share my experiences with you all! Week 2 has been hard. I haven’t really stuck to the programme all week. I was away with work down in Portsmouth on Monday night and all day tuesday, then had another all day meeting on thursday. I stupidly tried to do a cleanse day on thursday and completely failed! But I did successfully do one on Friday. So the results on the scales…I didn’t lose anything, but I also didn’t gain any weight either which was a miracle! I know it feels like I’m making excuses with work, and I probably am, but for the next two weeks I only have one meeting, next wednesday, and I am going to stick to the programme as much as I can as I really want a 4lb loss next week. I’m still craving the sweet stuff quite a bit, but I am hoping with some proper food planning this week I can reach my goal. Who ever said losing weight was easy clearly didn’t have a life! It has been a while since my last brunch post and I have been to brunch in between this and my last post, however somehow I forgot to blog about it! So I will have to revisit that particular brunch venue sometime in the future and get round to writing about it! This brunch took place on Saturday morning at a place called Coffee Architects in Leamington Spa. This place is cosy and very inviting, and the queues were already building up as I arrived, so to avoid a lengthy wait I recommend you arrive early! As you walk in there is an array of cakes to your left and boy do they look good! I have been following Coffee Architects for a while on instagram so definitely knew we were in for a treat. As always, my brunch buddy Hannah came along for the ride. Coffees ordered, it was time for the main event. There was so much to choose from, the normal menu and then the specials menu, which were both pretty impressive. But, after much deliberation, we went for the Avocado Smash, which was, avocado (I know the name kinda gives it away! ), their homemade baked beans, poached eggs all served upon sourdough toast and some hefty chunks of grilled halloumi. We also opted for a side of banana loaf french toast, or I did! We were pre-warned that the portions were rather large and were asked were we sure we wanted all three dishes? I mean what kind of question is that, err yes please! 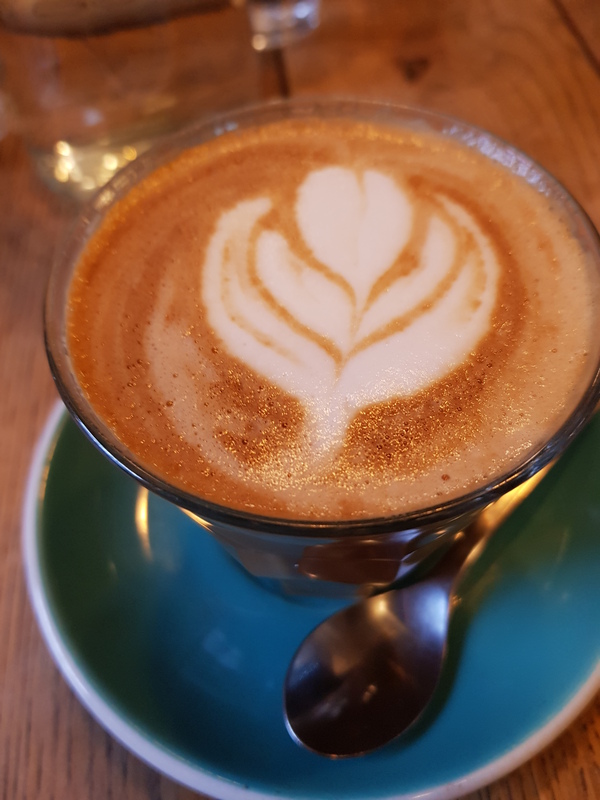 There was a little bit of wait for the food, but with both of us happily enjoying our latte’s, mine was made with coconut milk, we sat and soaked up the atmosphere and eyed up the cake selection from where we were sitting. Once the food arrived, it was pretty clear that the waitress had a fair old point about the portion sizes! The avocado smash was impressive to look at, as was the banana loaf french toast, but did they taste as good as they looked? It must be a day for silly questions, but yes they bloomin well did! 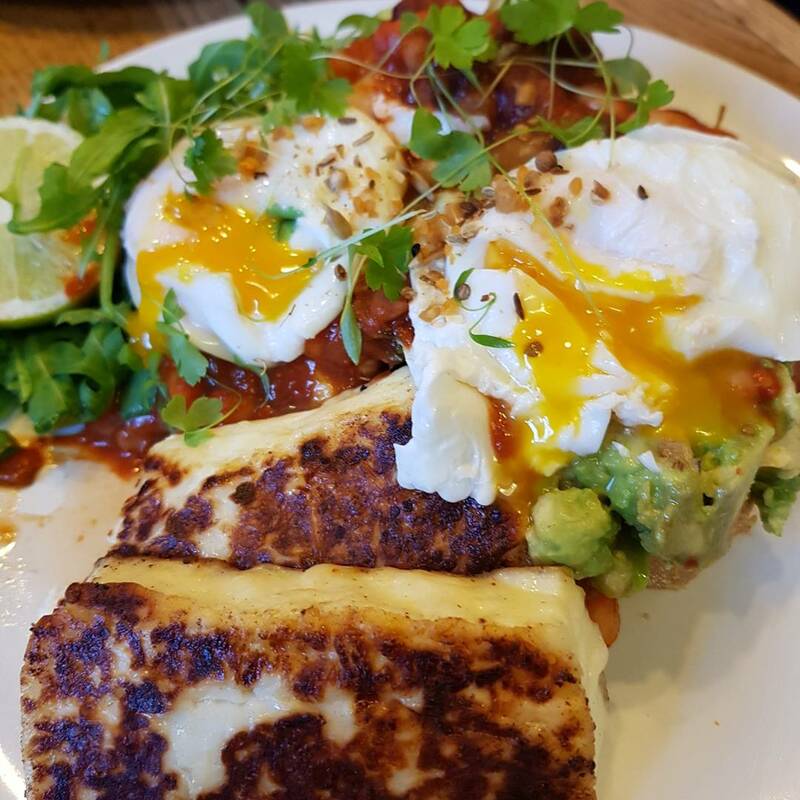 For me the highlight of the avocado smash was surprisingly not the avocado itself, but the beans and the halloumi. The beans had so much flavour and it does beg the question as to why on earth I buy Heinz beans when homemade is definitely the way to go (I feel a recipe post coming soon?!) and boy that halloumi was chunky! I don’t think I have ever seen a slice of Halloumi that big, and it was nice and warm and salty (oh err!). We both really struggled to finish, however we, or should I really say I, had the banana loaf french toast to get through. I was kinda regretting ordering it, until I took my first bite. It was really, really good banana bread, made even better by turning it into french toast, adding fruit and like a toffee, caramel sauce to it, and with the help of my trusty sidekick, we somehow managed to polish it off! There is something about brunch where I still can’t get over just ordering something sweet, hence why I had to have both a sweet and savoury option. The ordinary french toast looked pretty good too and it is very easy to get food envy here, until you look at your own plate and realise that your’s is just as nice! The Waffles are next on my list as they looked pretty incredible. After letting our food go down, we went up to order our take away cakes! The thought of eating another thing made me feel slightly queasy but for the sake of the blog, I thought I would take some home and maybe share it?? So I went for their Carrot & Passionfruit cake and a piece of their Rose, Pistachio and Raspberry cake. The carrot cake was really moist and the passion fruit really lifted the flavour, however, I was slightly disappointed by the Rose, Pistachio and Raspberry cake as the only real flavour I got was from the icing. I can’t recommend Coffee Architects enough, its perfect for breakfast, brunch, lunch and afternoon tea and cake! Why not check it out for yourself! Let me know in the comments below if you have been and what you had! Pictures are always appreciated!